Sackboy, karting and the "Play, Share, Create" concept are three of William Ho's favourite things. He is the design director at United Front Games (makers of Modnation Racers), and he counts himself blessed to be working on a project that incorporates said three things. 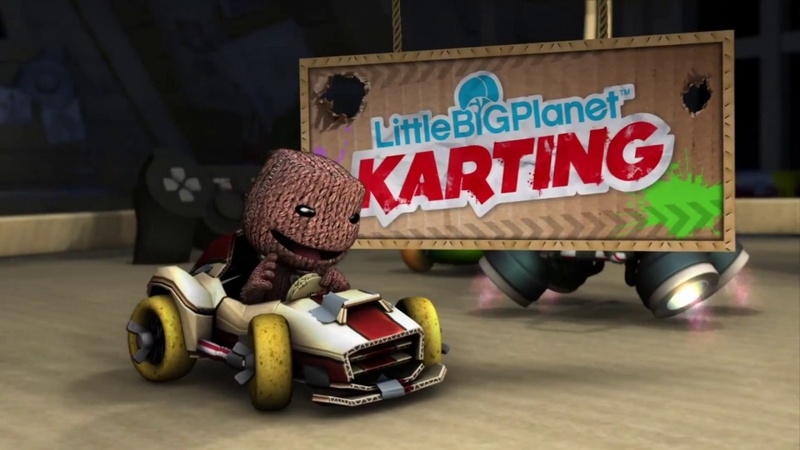 Media Molecule, creators of Little Big Planet, tasked United Front Games with making the inevitable Little Big Planet Karting. After spending an hour with it I'm glad to announce that the game is in good hands. It clearly comes across as a Little Big Planet title. Everything from the charming design to the editing tools look the part. Even parts of the game engine have been carried over from Little Big Planet 2 in a effort to make fans feel right at home. The biggest difference is obviously that Sackboy is now riding a go-kart. All the elements we've come to expect from a kart racing game here, where eight players compete in imaginative courses filled with obstacles. The tracks have also been equipped with various Weaponators that can be used to make things more difficult on your opponents. One such ability transform your vehicle into a massive boxing glove that knocks everything in front of it out of the way, much like Bullet Bill in Mario Kart Wii. The weapons come across as a bit unbalanced at first glance with several different homing missiles that make it painful to lead the pack. A good thing in this regard is that you can use all weapons in the opposite direction as well, and with skills and good timing you can avoid incoming missiles by using your own item as a shield. Other than that the controls feel as perfectly loose and perfectly in line with the genre's best. The drifting also has a nice feel to it. Fundamentals aside, this game is all about customising your experience. There is a character editor that is as deep as in the Little Big Planet games where you can fit sun glasses, afro wigs, and clothes on your sackboy. You can even give your own little Sackboy a beard made out of bacon (apparently William Ho's fourth favourite thing). You can create your own vehicle in the same manner, and you start out by picking a type of vehcile (motorcycle, tank, hover craft, and so on), and then there are hundreds of objects to customise it with. Want lemons for wheels? No problem. Want your kart to look like a potted plant or a bumble bee? Piece of cake. A number of popular items from the previous games will make appearances and if you want to drive around in an evil cupcake that is entirely your choice. Most of this probably feels familiar to those who played Modnation Racers, but while Modnation Racers was your typical kart racer, Little Big Planet has always been about creating your own experience, and it's only natural that Little Big Planet Karting takes off in that direction. The game will make use of the same tools as in Little Big Planet 2, so fans will be able to sit down with the game and immediately create great content. If you don't want to race to the finish line you can create check point races or items players need to collect in order to win. Or how about a co-operative mode where you roam freely and take on waves of enemies? If you want to create a computer controlled rival you can tweak their artificial intelligence to take them better and more vindictive. You can even create your own boss fights and turn the game into more of a traditional platforming experience than a racing game. You can also turn the camera around to create side scrolling levels. If you're not comfortable with the vehicle you can alter gravity and their weight to create a craft that handles completely differently. Perhaps you don't even want to use the roads in front of you, but rather take to the skies? Even the weapons can be tailored and tweaked in Little Big Planet Karting, something a lot of players missed in Modnation Racers.